The watch manufacture “Konstantin Chaykin” is eager to share the good news and presents the prototype of the Mars Conqueror MkI watch, timed to the International Day of Human Space Flight. April 12 is a special day – the day of the triumph of science and all those who work in the space industry today. Konstantin Chaykin expresses deep confidence that very soon the first conquerors will go to Mars … with the Mars Conqueror watch on the wrist. Integral text and pictures Konstantin Chaykin. Mars Conqueror: is it Elon Musk’s watch? Not at all, it’s Konstantin Chaykin’s watch! Konstantin Chaykin, a Russian inventor and watchmaker, presents his new unique development on the day, marked by two rare astronomical events. July 27, 2018, Mars and Earth will be in notable sectors of their orbits, where the distance between the planets is minimal. This event is called a perihelic opposition and occurs every 15 or 17 years. At the same time, another remarkable astronomical event will take place – it is the longest lunar eclipse in the 21st century. It will last 3 hours 56 minutes (from 21:24 to 01:20 on Moscow time). Konstantin Chaykin chose this day for the presentation of his new invention not by accident: the orange Mars will be supported in the sky by the unusual reddish tones of the eclipsed moon. This rare heavenly decoration especially dramatically emphasizes the astronomical character of the Konstantin Chaykin’s invention. Just some years before no one seriously believed in the practical feasibility of sending manned space expeditions to Mars. But now Mars constantly appears in the news line, explorations of the Red planet are included in the prospective space programs of Russia’s Roskosmos, USA’s NASA, SpaceX, Boeing and some other countries, conducting their own space programs. NASA in addition to making extensive scientific studies of Mars have started competitions of leading architectural bureaus for the design of Martian settlements as a part of the Centennial Challenges Program. Roskosmos and ESA develop a joint venture ExoMars aimed at the deep exploration of Mars and search for signs of life on it. Boeing Corporation states the first person to fly to Mars will get the Red planet on the rocket built by the company. In 2020, China plans to send to Mars an automatic orbital space station and landing rover for surface exploration. Further in accordance with the results of the unmanned expedition in 2040 or even earlier a manned flight to Mars will be organized. China is seriously preparing for the manned expedition and will soon erect a Martian village for crew training. The United Arab Emirates also builds Martian cities in the desert, India conducts its own program of Mars research. The concept of the new Mars Conqueror watch was appeared almost instantly: it should be a watch that shows the local Martian time, but constantly linked to the Earth time. Obviously, it is too early to speak about the development of independent human settlements on Mars. The watch should be equipped as well with an indicator of the spatial arrangement of the two planets realized in an intuitive way. The development of highly complicated mechanical module with three dials of Martian time, Earth time and planetary indicator took about eight months. This is a remarkably short schedule for a watch of a high level of complexity (in terms of the number of functional parts the Mars Conqueror watch is comparable to the minute repeater). 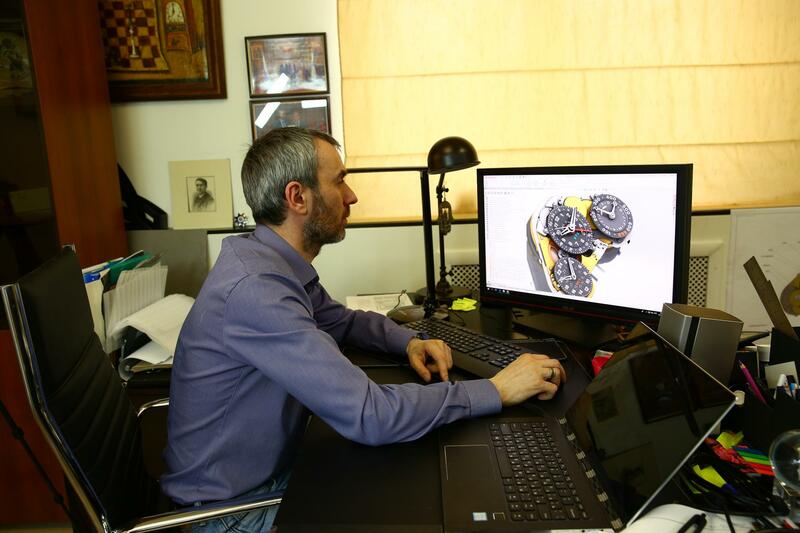 Definitely, that was possible because of Konstantin Chaykin’s great experience of astronomical watches and clocks development – starting with his Lunokhod, Decalogue wristwatches and to his numerous supercomplicated Computus Clocks. Nobody knows which of the space corporations will be the first to succeed in conquering Mars, but it is absolutely certainly Konstantin Chaykin is the first watchmaker who invented and produced a specialized 100% mechanical wristwatch suitable for the future conquerors of Mars. 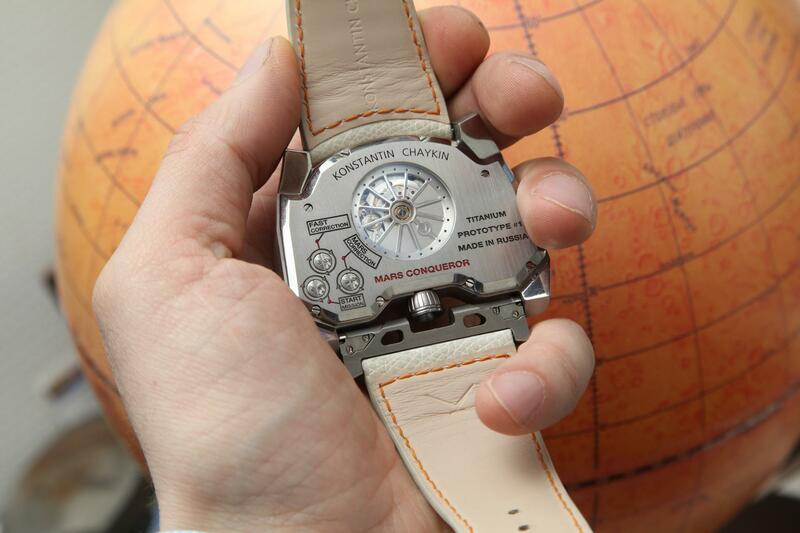 The Mars Conqueror watch features a unique combination of astronomical and space traveller’s functions that did not exist before. The astronomical clocks were appeared at the dawn of the mechanical watchmaking with the aim to reproduce mechanically the motion of heavenly bodies – as we see them from the Earth. Specialized space traveller’s functions are still at the early development stage in watchmaking. This is due to the fact that manned expeditions are conducted in Earth’s low orbits (with the exception of several lunar missions of the 1960s and 1970s), so cosmonauts and astronauts didn’t need any special “space” time measuring. Their life and missions during orbital flights are based on Earth’s time. Nevertheless, long before the Martian expedition could seem a reality, in 1954 American astronomer I. M. Levitt designed the Space Clock Mars, which might be used further by the conquerors of Mars. There was the first time in the history of the watchmaking when real space traveller’s function was implemented – as an electromechanical clock indicating Martian time and date, supplemented by an indication of Earth time and date. Two copies of Space Clock Mars were produced by the American watch company Hamilton according to Levitt’s design. Levitt’s stationary clock had electromechanical movement, that means the state of the art for the middle of the 20th century, but the movement was far from to be compact enough to be used in wristwatches. The production of the first wristwatches, both mechanical and quartz, with the indication of Martian time was started by the Californian watchmaker Garo Anserlian in 2004. Anserlian’s wristwatches were used by the NASA engineer’s team controlling Martian rovers Spirit and Opportunity. 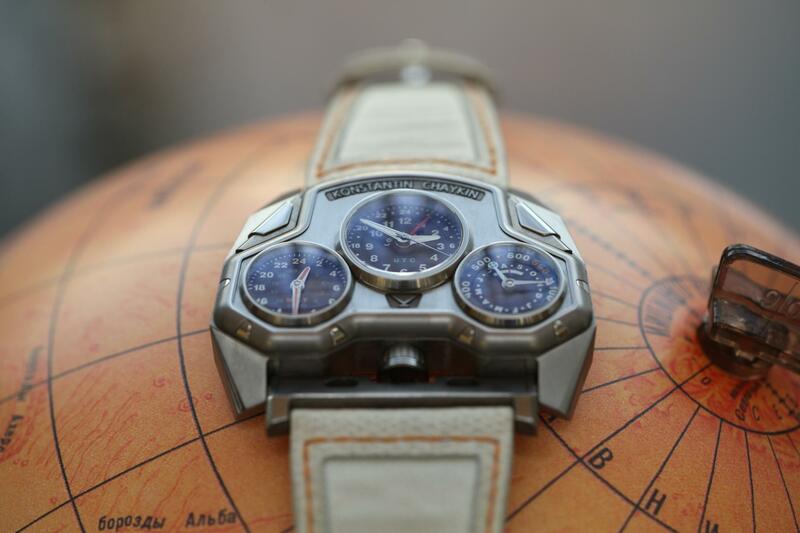 Konstantin Chaykin made a significant step forward, combining for the first time in the history of watchmaking the space traveler’s functions of local, i.e. Martian and Earth’s time and date indications (Martian and Earth’s dates in Mars Conqueror watch are indicated approximately) with the astronomical function of the indication of Mars and Earth positions. The latter is produced as a planetarium. The astronomical indication has also a very important space traveller’s function, intended for future Mars conquerors: it shows the positions of Earth and Mars in their orbits, allowing to estimate the distance between the planets, it has as well an indication of the moments of oppositions and perihelic oppositions, where a distance is minimal. Mars Conqueror is hundred percent mechanical watch that guarantees their good operation both during the future space flight, and on the surface of Mars, where, as known, the watch will not be protected from the radiation due to the weakness of the planet’s magnetic field, and because of the tenuous Martian atmosphere. Especially for the Mars Conqueror watch, Konstantin Chaykin has developed a module with unique astronomical and space traveller’s indications arranged in three dials. The first dial contains the Earth time with a central second hand as an indication that watch wasn’t stopped and in working order. On the second dial, we have local Martian time and on the third dial, there is a planetary indicator of the relative positions of two planets and their oppositions. The indications of the average solar time on Earth and on Mars are synchronized, the movement uses only one balance assembly. This is the guarantee that Mars Conqueror watch will not accumulate deviations in the indication of Earth and Mars time, which could occur in a movement with two balances. Mars Conqueror’s complicated module of astronomical and space traveller’s indications is completely made, assembled and adjusted by the Konstantin Chaykin Manufactory in Moscow (Russia). The module consists of 159 parts, including 30 wheels, 6 pinions and 6 jewels for reduction of friction and wear. The module is installed on a reliable, tried and tested automatic Caliber Eta 2836-2, a real workhorse of the modern watch industry. 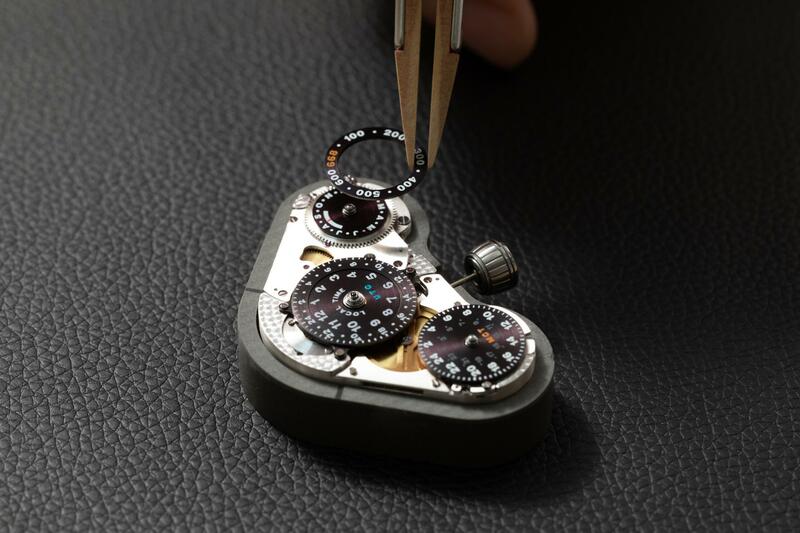 The watch is equipped with three correctors for indicators adjustments, placed in the caseback. 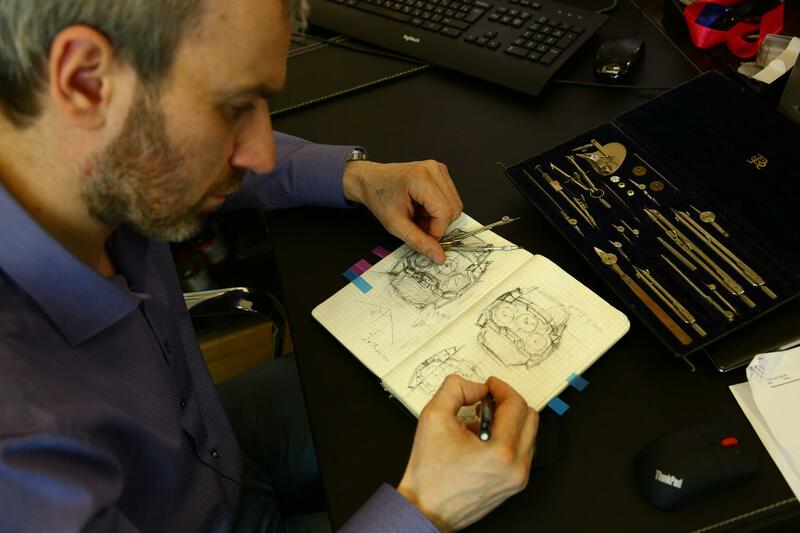 Having spent about two hundreds and fifty Martian sols with a Mars Conqueror watch on his wrist, Konstantin Chaykin is ready to share his impressions of the watch and his plans for the future. As it was conceived by master and inventor of Mars Conqueror watch, it can be used both on the surface of our planet and by the future conquerors of the “red planet” during space travel to it as well as on its surface further on. The watch is designed for simultaneous indication of local time and standard or UTC time on Earth, of average solar time on Mars, and of additional space and astronomical functions – Konstantin Chaykin had implemented in the watch movement 8 complications in total. Highly complicated watch mechanics of Mars Conqueror watch was obviously required to be meticulously proved and tested, especially if we will take into account 175 parts used for assembly of the display module and the fact that the number includes as many as 30 wheels. Therefore, before disclosing information about the new Mars Conqueror watch to the public, Konstantin Chaykin had decided to perform it’s thorough all-around testing. Calibre K20-1, the original version of the Mars Conqueror MkI prototype movement, as well as the prototype itself was presented to the public in a friendly privity manner in Moscow on July 27, 2018, at the very moment of the closest opposition of the Mars and our planet. 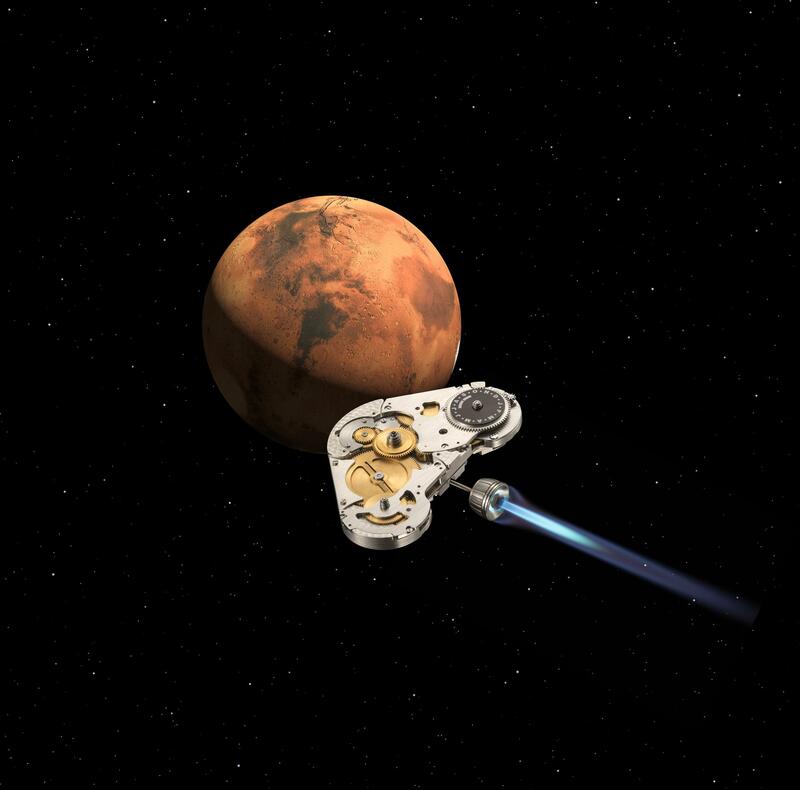 Meeting the persistent interest to the project expressed by numerous collectors and friends of the brand during BaselWorld-2019 fair Konstantin Chaykin had finally decided to present to the public his Mars Conqueror watch. April 12, 2019, the date of official presentation, was chosen because it is the International Day of Human Space Flight, celebrated annually around the world in honour of the anniversary of the first manned space flight, which was performed on April 12, 1961, by the Soviet cosmonaut Yuri Gagarin on the Vostok-1 spacecraft. 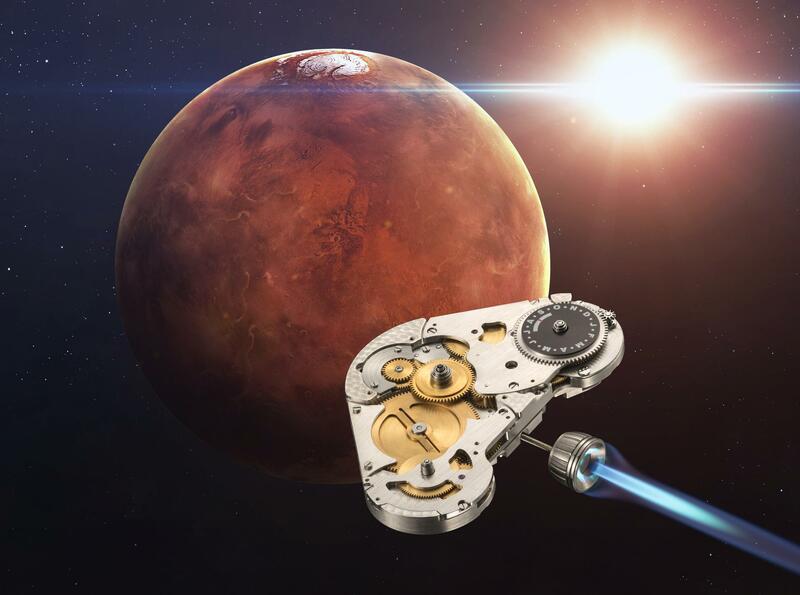 The development of the first truly Martian and fully mechanical complicated watch is a long and laborious process, while the same thing we may say about the preparation for the first manned flight to Mars. During testing, the first prototype of the Mars Conqueror watches therefore described by Konstantin Chaikin as “Mars Conqueror MkI”, the performance and functions of the originally developed movement were confirmed entirely. The testing had revealed two minor technical bugs that, however, do not have a destructive effect on the overall functionality of the watch. Nevertheless, Konstantin Chaykin had decided to improve Caliber K20-1. In particular he eliminated the backlash of the wheel system of the Martian time dial as well as modified the design of the rocking bridge in the Martian time indication module, thus allowing to disengage wheel without switching the module to the correction of Coordinated Universal Time (UTC), that was necessary in the original design of Caliber K20-1. of complicated shape and specific softly rounded bezel adorned with a refined matte finish. 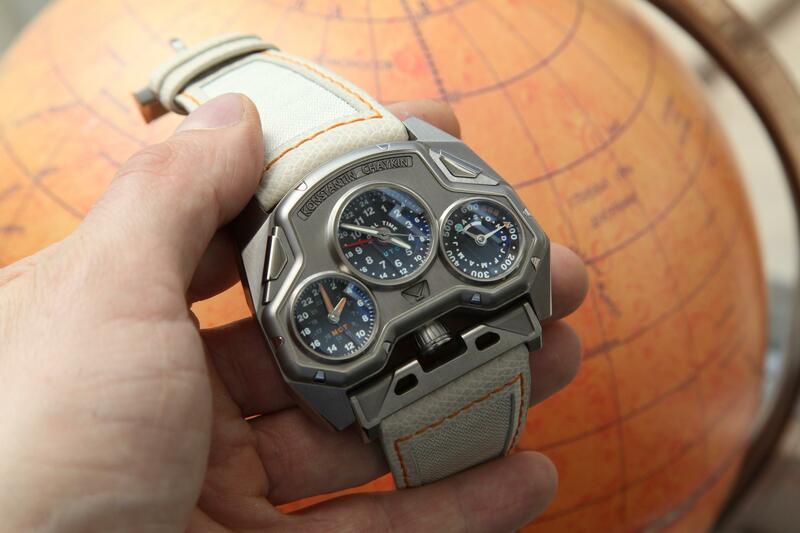 Therefore, Mars Conqueror MkI watch looks like an impressive implementation of 1960s space technics’ style. Watch’s conical crown, placed into case recess meticulously performed at 6 o’clock, instantly resembles by the shape and finish the nozzle of a spacecraft’s jet engine. The final touch of the design is a white leather strap with contrasting orange stitching and distinctive decoration by the white fabric used for tailoring Russian space suits… So Konstantin Chaykin’s message is obvious: he will not stop to invent new watch straps – again and again. However, presenting Mars Conqueror MkI prototype to the public, Konstantin Chaykin does not reveal all his trumps. 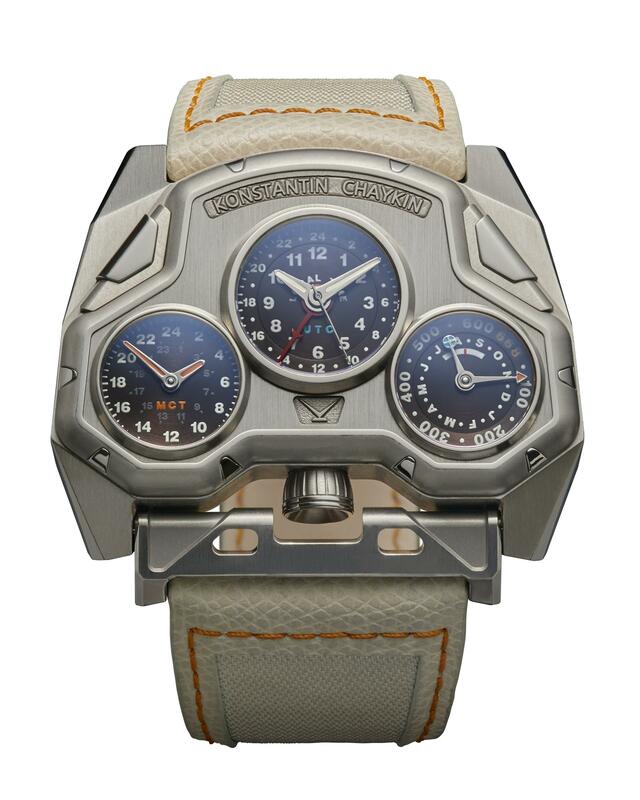 He had already developed a new striking design of Mars Conqueror MkII watch, to be released in a limited edition and revealed in the fall of 2019. For more information visit the Konstantin Chaykin Website.